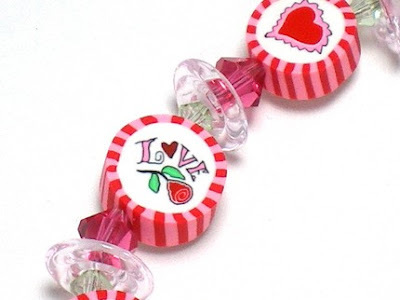 Another batch of cupcake beads I was lucky enough to snag. 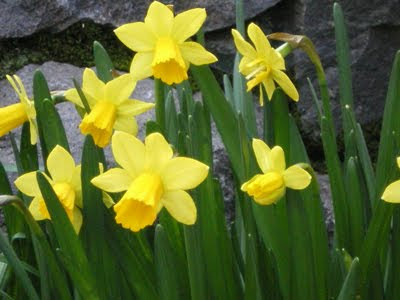 Just something pretty for you to look at throught the weekend. See you soon with cupcakes! 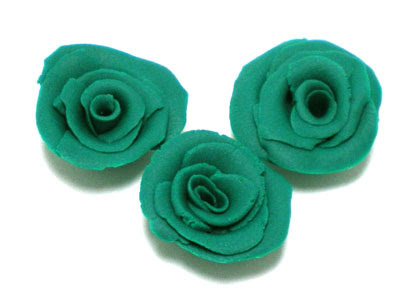 I thought I better make some emerald green rosettes. So far so good. Next up.....plum. What do you think of my clay rosettes? I had SO much fun making them. These were my FIRST attempt! I love the color too. Clay rosettes aren't very available on Etsy since my favorite artist closed up due to a medical situation before Thanksgiving. So I thought, what the heck, why not try to make my own? I also played with the cane technique to produce color inside of color. I did all the rolling by hand and got some "wonky" shapes and thicknesses. Uniformity did not happen. So on the next batch I'll be using my little pasta machine to get closer to perfection. My intended round beads turned into a slightly triangular shape so I just went with that and squeezed them a little more to define the triangle and I like them. I DID end up with a few rounds though. Man, even cutting these must require a specific technique so I'll be checking out books for sure. 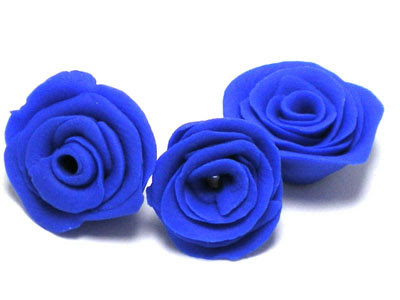 So, I got really brave and opened a clay bead shop on Etsy called.......ClayBeads....heehee. It was tough coming up with a username that HADN'T been taken. So I thought, okay, what do I want to do with this shop? Answer: sell clay beads. 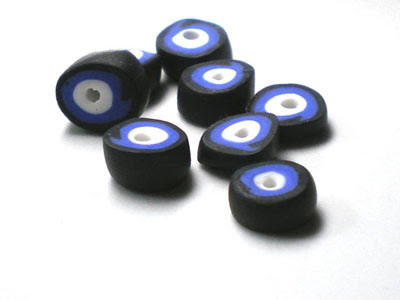 I typed "claybeads" out of curiosity and it was available, so there you have it! I hope you come and visit me. Just click HERE! Ahh, a nice weekend at home. 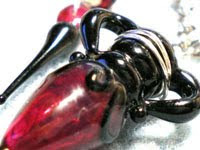 I'm working on something special with this amazing glass item in black and fuschia. I mentioned it in a previous post so I thought I'd give you a little taste of what is coming. 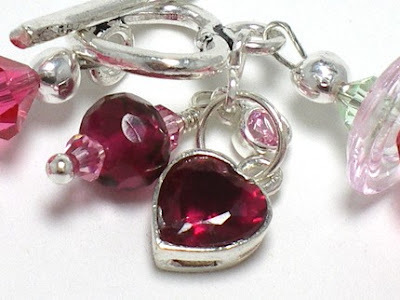 Think cranberry for that deep pink glass. I have some pretty Czech glass in the same color and I'm challenging myself to work all this into a necklace with a Victorian feel. We'll see what I end up with. Speaking of something special, my dad brought home one of these fun pincushions home after being stationed with the Navy in Japan during the Korean war. As a child I always thought it was a very unique and unusual item. When my mom passed away, Dad got rid of so many items in the house and I have a feeling this might have been one of them since I haven't seen it anywhere. I might be wrong, but nonetheless when I saw these tiny ones at Cost Plus World Market around Christmas I thought I'd get one of my own. 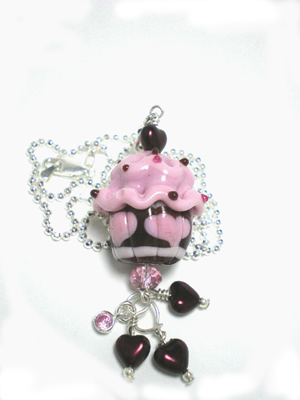 I'll be back during the week with fresh cupcake jewelry to show you. jasmine for over a month, yet the roots found a source of nourishment which resulted in the first blossom on Monday. One corner of the vine has the first cluster of blooms. The fragrance is wonderful and most intense at night for this Star Jasmine. This little group of flowers is just on the other side of the fence so my neighbor can enjoy them too. My bonus today as I was photographing the flowers was a fabulous spider web full of drops from a brief rain shower. It's amazing that what looks like a delicate webbing could stretch like a hammock under the weight of the water and still keep itself together! I also heard a couple of house finches chirping to one another in the beginning of their quest for the best nesting area of these vines. I have 2 sections of it and recently cut their favorite one waaaay back thinking it was early enough to grow back for their nesting dates, but they are scoping the area out early this year. Last year, 2 mating pairs fought over the same section of vines so one pair is smarter this time around. Any hints of spring yet where you live considering 49 states in the union recently had snow at the same time??? 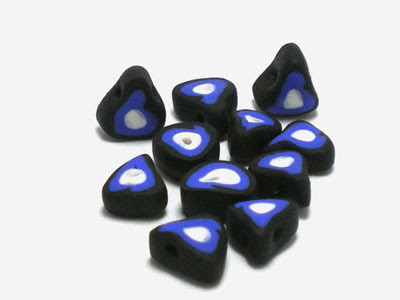 I'm working these handcrafted alphabet beads in polymer clay from Kennick into a bracelet. 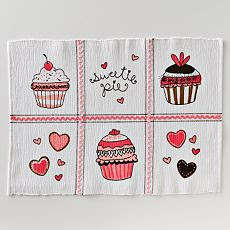 They are sitting inside a hand embroidered cupcake on a towel my friend sent me. The towel was near a plant which my husband overwatered. The towel was just close enough to wick up the water which of course, had drained through dirt, right? 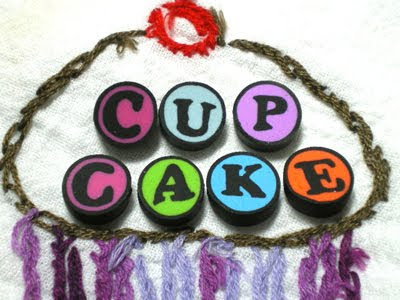 I had to wash it to remove the stain.....which was successful, but even gentle hand washing loosened some of the thread...but I still have it and still love it and it works as a great backdrop for my cupcake letters, don't you think? I may be MIA for a few days. Be sure you read back on my past posts since I've been writing more often. 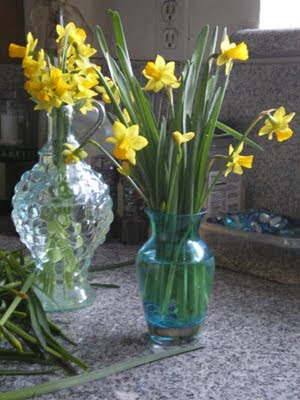 My little annual harvest of daffodils from my back yard yielded enough for 2 of my blue glass vases...one for the kitchen & one at my desk. How pretty. My star jasmine just started blooming as well. Can you tell I live in California? I'm having fun with The Background Fairy. The website offers free backgrounds and headers and today I was in a brown & cream colored mood and of course, she had just what I needed. It's an easy change to make and only takes minutes. 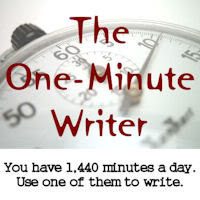 I highly recommend "playing" there to keep your blog looking fresh. You can also click her "Graphics Fairy" box and gain access to amazing free vintage images to dress up your projects! 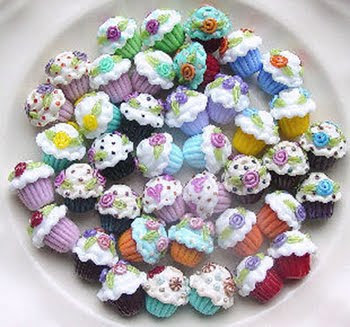 See you soon with new cupcake creations! earrings & necklaces that will join my current stock, seen HERE. I did...it contained several sweetheart surprises! 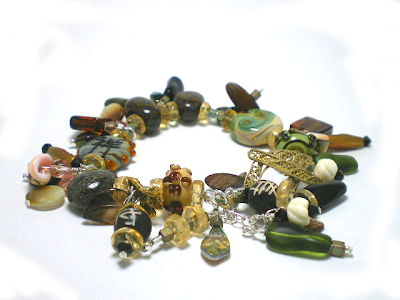 The Bead Soup Party is ON! 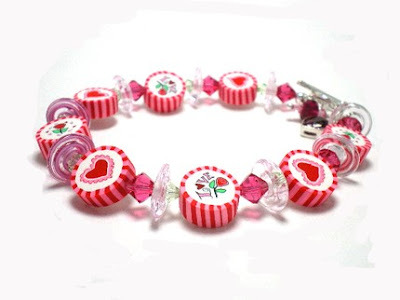 This bracelet is my entry. Leslie from Bei Mondi sent me ALL of these beads and I decided my challenge would be to USE all of them! 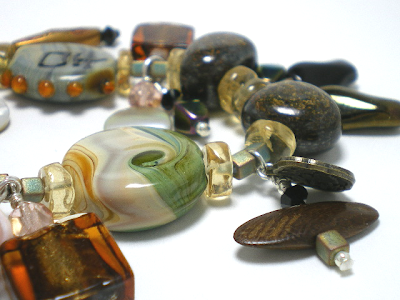 The requirements were that one focal bead and the clasp we received had to be included. 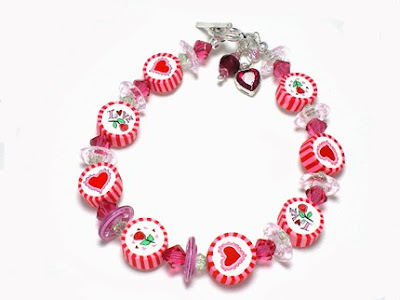 I took it to the extreme and used them all which led to a nice "hunk" of a dangle that makes this bracelet really fun. It turned out to look more like a charm bracelet and it feels really good on my wrist...yep, I'm keeping this one for myself! When the respective partners got the packages of beads, they were tasked to make something with all or part of the soup, take a picture, and post it on their blog on February 10th -- TODAY! Now, everyone gets to hop around to all the Party Blogs to see what's been made! Scroll down for the list. 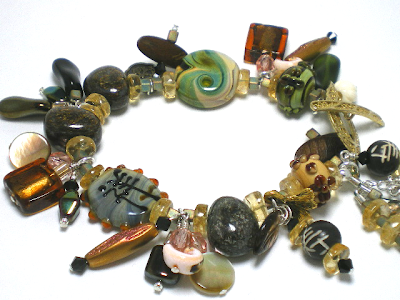 My partner was #30, Leslie of Bei Mondi.The only items I added from my bead boxes were the fat Bronzite stones flecked with gold....the little gold edged green cubes and the round, flat citrine disks you see throughout the bracelet. Now you are off to see the others...there are a lot so be sure you break up your time into a few visits so you can see them all. they might not normally have in their own bead box. you might not yet have seen. So come on back now, ya hear? How amazing is this heart cupcake?! Mahogany colored cake portion matches the pearlized garnet colored glass hearts on the top & in the danglies. My favorite pink glass, "dark pink by Lauscha" was used for the hearts on the cake & for the icing. Add the sterling heart bail and chain and it makes you say "wowza"! 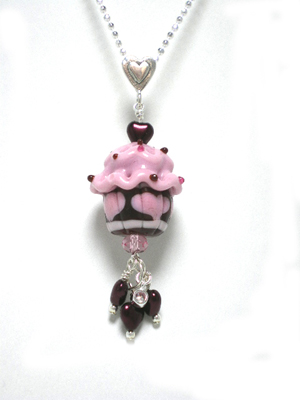 This deluxe cupcake line was dreamed up my me on paper and wound into hot glass by Payton Jett and is nearly double the size of a "normal" lampwork glass cupcake. It's fabulous, just fabulous. See more detail & photos HERE. 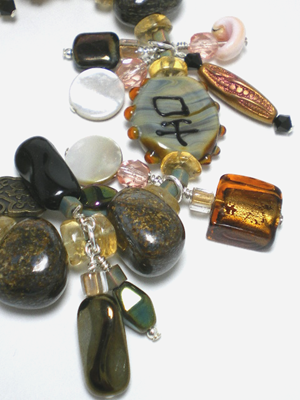 I finished my "Bead Soup Party" jewelry and will be posting it on the big reveal day of Wednesday, February 10th. Come on back now, ya hear? 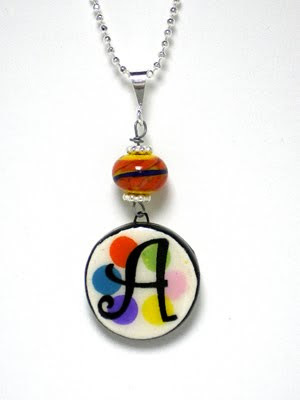 Ceramic alphabet necklaces from my shop...cute huh?